Welcome to the May edition of the Inclusive Growth Bulletin! In this issue, we bring you a selection of new, completely free IPC-IG publications, ranging from studies on the relationship between poverty reduction and energy consumption, to youth-led entrepreneurship development in Sierra Leone. We also bring you news and updates regarding the IPC-IG's policy dialogue activities, including participation in events. 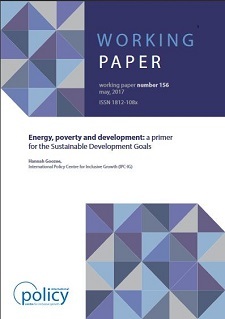 In the Working Paper “Energy, poverty and development: a primer for the Sustainable Development Goals”, Hannah Goozee (IPC-IG) reviews the current literature concerning energy and electricity consumption, and poverty and development, to show that there is a need to directly address how poverty levels will shape future energy consumption. This publication is available in English, and an accompanying One Pager is available in English, Portuguese and Spanish. In the One Pager “Business development centres for youth-led entrepreneurship development in Sierra Leone”, Molla Mekonnen Alemu (University of Leicester) addresses the major achievements of and lessons learned by the Youth Employment and Empowerment Programme (YEEP), developed and implemented by the United Nations Development Programme (UNDP) and the government of Sierra Leone. The programme is part of the ‘Inclusive Growth and Sustainable Development’ programme cluster. In the One Pager “Gender-sensitive social protection in the Caribbean”, Raquel Tebaldi and Charlotte Bilo (IPC-IG) summarise the main points of the discussion held during the eponymous webinar, organized last December by FAO and the IPC-IG, and hosted by socialprotection.org. The webinar addressed the role of conditional cash transfers and other social protection programmes in tackling some of the needs of rural women, among other topics. This was the fifth webinar in the gender-sensitive social protection series. This publication is available in English and Portuguese. Finally, our 2016 Activity Report is now available in Portuguese. If you want to learn more about the IPC-IG’s work and achievements in 2016, we invite you to read our institutional One Pager, available in English, French, Portuguese and Spanish. The One Pager “Integrated Data and Information Management for Social Protection”, by Valentina Barca (Oxford Policy Management) is now available in French. The One Pager “The conditions for conditionality in cash transfers”, by Luca Pellerano and Valentina Barca (OPM) is now available in Spanish. This study was previously released in English and French. 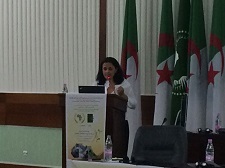 The Centre participated in the "Regional Conference on Child Poverty in the Middle East and North Africa: from Measurement to Action", organised by Morocco’s National Observatory of Human Development (ONDH) and UNICEF MENA, in Rabat, from 15 to 17 May. 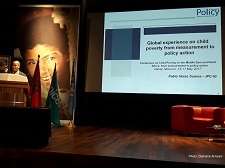 IPC-IG's Senior Research Coordinator, Fabio Veras, presented the session "Global experience on child poverty from measurement to policy action". IPC-IG’s Senior Research Coordinator Rafael Osorio also participated in the event. The IPC-IG, together with the governments of Brazil and Mozambique, the World Food Programme (WFP), the United Nations Development Programme (UNDP), UN Women, the United Nations Population Fund (UNFPA), and the United Kingdom Department for International Development (DFID), organised the seminar "Innovative Partnerships in Social Protection, Food and Nutrition Security and Gender: Mozambique, Brazil, U.N and DFID", in Maputo, from 3 to 4 May. The event gathered an audience of public policy managers and operators of South-South Cooperation projects in Brazil and Mozambique, as well as international institutions. It was organised under the scope of the project "Brazil & Africa: Fighting Poverty and Empowering Women via South-South Cooperation", financed by DFID. The Centre is responsible for the implementation of Outcomes 1 and 2 of the project. IPC-IG's Senior Research Coordinator, Diana Sawyer, delivered a presentation that introduced the main topics and achievements of the project. Her presentation was part of the panel titled "Brief introduction to South-South Cooperation projects: Brazil and Africa and National partnerships". During a thematic round table on food and nutrition security (FNS), social protection and monitoring and evaluation, the IPC-IG team had an opportunity to share its knowledge. Senior Project Management Officer, Lívia Nogueira, delivered a presentation on the lessons learned and best practices regarding the production and sharing of knowledge among Brazil and African countries on FNS. Raquel Tebaldi, IPC-IG Research Associate, and Rosana Miranda, IPC-IG consultant, shared lessons learned and best practices regarding social protection and South-South learning, and on FNS, respectively. The IPC-IG joined the Annual International Conference 2017— “Inclusion, Integration and Transformation: Social Protection for Persons with Disabilities in the SADC”, organised by the Southern African Social Protection Experts Network (SASPEN), in Johannesburg, on 3 and 4 May. The Centre's Research Associate, Raquel Tebaldi, presented on the main debates and current challenges faced by social protection for people with disabilities in Brazil. The Centre was glad to participate in the Second Meeting of the Specialised Technical Committee on Social Development, Labour and Employment (STC-SDLE-2), organized by the African Union, in Algiers, from 24 to 28 April. With the theme “Investment in Employment and Social Security for Harnessing the Demographic Dividend”, the meeting brought together African Union Ministers and government experts to discuss which investments would be required to meet the opportunities and challenges involved in reaping the benefits of the demographic dividend, with the inclusion of vulnerable groups, among other issues. In parallel, the African Union hosted the ninth meeting of the Social Protection Inter-Agency Cooperation Board (SPIAC-B), also in Algiers. IPC-IG's Senior Project Officer, Mariana Balboni, attended both meetings and delivered a presentation on 26 April, on the activities related to Africa of the socialprotection.org online platform. 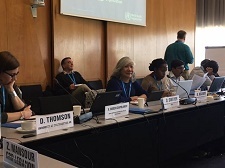 Our Senior Research Coordinator, Diana Sawyer, attended the World Health Organization (WHO) technical meeting, held in Geneva, from 18 to 21 April. The objective of the meeting was to consolidate information and lessons learned that will enable the WHO to finalize a vaccination coverage reference manual, with the goal of improving the precision, accuracy and overall quality of immunisation worldwide. On 25 May, the socialprotection.org online platform will host the webinar "Poverty reduction in the rural sector: what can countries learn from China’s experience? Achievements, challenges and the way forward in the context of the Sustainable Development Goals". This is the first webinar of the series Rural Poverty Reduction: #Endpovertytalks, organized by FAO, the International Poverty Reduction Center in China (IPRCC) and the IPC-IG. Register here to participate. If you want to receive first-hand information about the webinars hosted by the platform, as well as interesting information on social protection, the team invites you to subscribe to receive socialprotection.org's monthly newsletter. The IPC-IG hosts the socialprotection.org online platform.